Well, it was uphill all the way for our first stretch goal, if by “uphill all the way” we mean up and down and up again; but we finally made it, and we’ve got just over a week left to hit the second stretch goal. 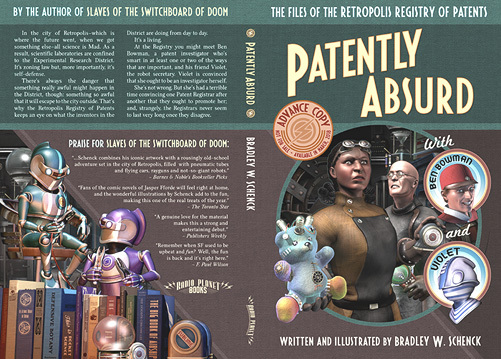 If we get there, this is what happens: I have the funds to arrange a Kirkus Indie review; and everybody who pledged over $50 will get a memo notebook with the Patently Absurd cover art on its own cover. These are nice little notebooks, as I can tell you from my personal scribbling experience. It’s a harder goal to reach, at $1900, but we may have the urgency of the project’s end on our side. It’s coming up! So if you have friends or if you see strangers who might like the book, this is the time to tell them all about it wherever you find them: on Facebook or Twitter, or at your own blog, or at GoodReads or LibraryThing or, in fact, anyplace at all. It’s the larger pledges that will benefit from this stretch reward, so I’ve added a new set of ten “Collector II” rewards at $65. They’re just like the original Collector rewards except that they cost a bit more. That’s so you early adopters have a reason to look smug. If you need one, I mean. In other news, today I should see my third proof copy of the book. The last one was pretty great, but I’m still fiddling with color profiles for the cover.